Richie Whitt's DFW Sportatorium: Rangers Sign Manny Ramirez. Can't Believe I Just Typed That Sentence. 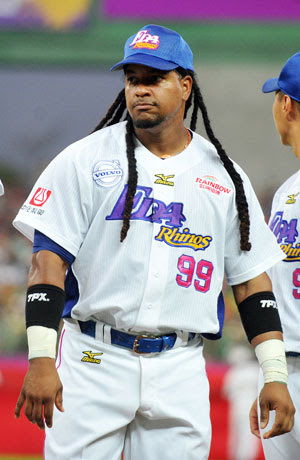 Rangers Sign Manny Ramirez. Can't Believe I Just Typed That Sentence. He's 41. He'll have to cut his braids before he reports to Triple-A Round Rock. He was last seen playing for a team called the Rhinos in Tawain. And, for a long time, he was the most feared hitter in all of baseball. Yep, the Texas Rangers have signed Manny Ramirez. That's Jon Daniels being Jon Daniels (Kenny Lofton, Vladimir Guerrero, Sammy Sosa, Eric Gagne, et all). Hoping he gets the old Manny being Manny. Low risk. High reward. Fun times. I like this deal. As Richie says, low risk and high reward. Berkman hasn't been getting the job done and Manny provides some big time power upside. If he can't do what he did in Taiwan here, no big deal deal just release him. If he hits at AAA then try him out at DH with the big league roster. Might as well. If he gets it done, super. If not, cut him and send him on his merry way. The Rangers do have a history of giving a guy another chance. See Hamilton, J. Can he start for Murphy tonight? I welcome this if Tom and Buzz will go crazy for Manny's home runs the way they did in Taiwan.